For many, the idea of sustainably raising livestock in the Upper Midwest, especially in Zone 3, is intimidating. Some farmers have had limited success, while others have failed miserably. It just seems that the animals don&#x2019;t produce or grow like one had hoped they would. This book holds many possible solutions for the challenges of successfully and sustainably raising livestock in a Zone 3 climate. There are successful farmers in this part of the U.S., and indeed in many other parts of the world with a similar climate. Most of that is due to adequate planning and realistic expectations. 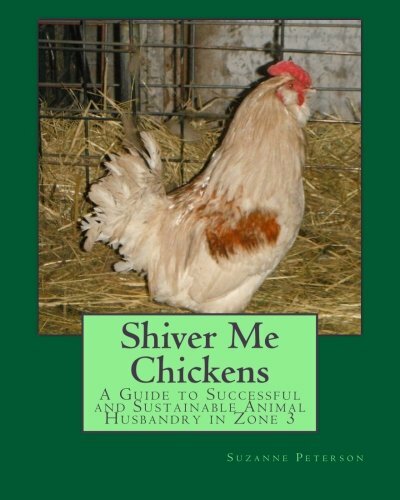 Shiver Me Chickens is a step by step guide for planning and raising animals successfully despite the variable and in some ways extreme weather conditions. It will help the novice farmer to focus on caring for animals which require less attention and that will fit into their plan for increased self-sufficiency. It will reveal how long it really takes to raise livestock in this climate, allowing for realistic expectations. It will explain simple and inexpensive means of getting the very best out of the animals. And, by following the instructions in each chapter, it offers an easy to understand planning process to help ensure a thriving and rewarding animal husbandry experience.